To those folks who were interested in the chicken collar: The dog just ate the chickens. Back to the drawing board for that dog. Right now he's under close supervision every day he's at the farm. He's a nice dog, but I can't afford to lose any more birds. I've had a bad experience with a farm sitter guy. The fellow I paid to look after my farm seemed to have struggled with the whole thing, and ended up causing $1200 damage to my tractor and $300 to two implements. Details follow. His job was to feed the chickens, turkeys, ducks and geese, and to make sure that the electric fence was on and working. I left him with a chore list, and walked him through the chores, timing it as we went. It was about 20 minutes a day, with 40 minutes once a week. Feeding the poultry was putting a bucket into one sack of feed and transferring it to the feeder right next to it. The poultry feeders hold 200lbs of feed each, so you only need to fill it every 3rd day or so. You throw a bucket of feed out for the ducks and geese, and you're done. For being on call to handle any animal emergencies and the 5 hours of work a week, I offered to pay him $200 per week -- for a total of $600. Yes, I could have found someone to do it less, but I trusted the guy, and he seemed to be an animal person. I left him the key to my tractor and my dumptruck -- sometimes you need to move stuff or the equipment itself, and my brother showed up once a week to do various repair jobs and fill the pig feeders. I returned a day earlier than planned, and found the poultry feeders empty, dead poultry around the yard, and that two PTO drivelines had been ruined by this guy trying to use my brushhogs to mow some land of his. He'd also used the tractor to clear part of his land and do some scraping of junk, and somewhere during the last week the drivers side door (made of glass) had been broken. I also had a voicemail full of messages from neighbors and friends that the cows had been out repeatedly and that there were random people at the farm at least 3 different times. When I counted the chickens and ducks I'm missing a bunch of them. The drivelines for the implements are $150 each. The door glass is $600. (yes, that seems excessive for a tractor cab door, but everything kubota is gold-plated, so that's what it costs). It kills me that i had just replaced that door glass this spring, and here in the summer I'm replacing it again. I was pretty mad about this, and confronted the fellow. He claims that the door on my tractor was "shot out". I'm having a hard time believing that. His explanation for going and hooking up my brushhogs and ruining two drivelines? "the bearing was dry!!". woof. "Look, I've treated you fairly, and I am asking you to tell me the truth here in return. Just say what you did and we'll go from there", I said, but he had his story and he's sticking to it. I think he broke the tractor door lifting a hog panel that I asked he put on a section of fence that the cows appeared to be hopping over. So that $600 loss I'll just eat, as I would for any workman doing a job for me. Silly me for telling him to use the tractor to do that, but that's part of the job of being a boss. The drivelines are a different matter. He had to go find the brushhog, find the driveline, hook it up and go and break it. And while he talked to me several times before I returned, he didn't mention a word of this destruction to me. If you borrow someones tools you should return it to them in the same shape you borrowed them. I think it's fair for him to replace both drivelines. That $300 is on him. The sow really wasn't the farmsitters or pig feeders fault. It died for some unknown reason, and while I'm sad that it went, there's really no blame there. I'll just add that to the cost of my vacation. ve got; is a suspicion at this point. So on the vacation tab that one goes. This is one of the downsides of farming -- you really can't take a vacation. If you do it right you are doing something you love and you don't need a break. I don't have a conclusion here. Just saying what happened. Hi folks. Not many people knew, but I've been gone for the last 3 weeks, rowing down the colorado river through the grand canyon. It was a good trip, and I'll write it up in a few days. While I was gone one of my sows had a litter, which was expected, but then died, which wasn't expected at all. My farm sitters didn't find the body; I did when I returned. I found her in the pig wallow, and she was about half in the water, half out. I don't know how long she's been dead, but she was pretty decomposed. The weather has been hot the last couple of weeks. The sow that died is red-n-black, who I've written about on the blog in various places. She was a good mother and very protective of her piglets, and she'll be missed. It was pretty hard to get her out of the wallow. I couldn't get the tractor very close, and I ended up pulling her in half when I put a chain around her to get her out. I ended up gingerly dragging her out of the mud using the front loader and then scooping up all of the pieces when I got her on the bank. Wish that I had found her sooner; I'd like to know what killed her -- prolapsed uterus, maybe? I'll never know. Having a boar has been interesting for me. He's not the biggest of our pigs, but he sure is the one that I watch carefully when I'm working with the pigs. Here's a pretty peaceful moment -- apparently rooting in the dirt is exhausting, and he's fallen asleep with the dirt still on his nose, next to another pig. Of all the pigs, this boar is the most solitary. he's definitely curious about what I'm up to. If I'm working somewhere, he'll come and see what I'm doing. At times this just means a few grunts, other times he'll come over and nudge what I'm working with, or attempt to taste it. Pigs explore with their mouths. Sometimes he'll see me step into their pasture and come galloping across the pasture towards me. I then have 5 seconds to decide whether he wants a backscratch (his favorite) or something has pissed him off. When this boar gets shocked by the electric fence he will seek out and bite the nearest pig in retaliation. In fact, if another pig gets shocked and squeals he'll go and bite another pig. Same is true for any other mishap. He could be walking across the pasture and have a branch stick him. He'll look around, locate the nearest pig, and go bite it. So when another pig squeals, or he squeals, that's my cue to locate the boar visually and assess the situation. I don't want to be on his list. One of the things about the pig social groups is that they almost always involve at least 3 generations of pigs. An older pig or two, a couple of medium pigs, and a few young or very young pigs. It starts out with a piglet following around a bigger pig and learning from it. That piglet eventually grows up, and piglets start following it around, and the multi-generational friend group is born. Across the bottom of this picture is big momma, one of our oldest sows at 4 years old. To the left in the center is the long pig, so called because she's got a really long body. to the right are the two youngest pigs. This is a social group. I've talked about pigs being social with each other. Here's three of our sows that are in a social group. The two pigs closest to me are about the same age, but different litters. the larger black pig in the background is the age of their mothers. Here they're all snoozing and the black and white pig has its hoof on the face of the other pig. They're out. Snoring lightly, enjoying the nice weather. Full, plenty of good dirt to root in, and warm. Life is good. Pigs are creatures of habit; they have definite daily routines. This is a pig path that leads from the feeder to the waterer. I intentionally put them a few hundred feet apart to encourage the pigs to use more of the property. They do make the trip back and forth, but in a way that I didn't foresee. they use the exact same path each day. if you look carefully at the grass you can see mud on it; they eat, then bath in the mud, then drink, and repeat. Here's a longer view. the waterer is in the distance, a little to the left of center of the photo. This path goes directly there. I was hoping that they'd consume more of the grass, but I guess that's up to the ruminants now. I have to constantly turkey-proof my farmyard to prevent the little bastards from offing themselves. That's 1x2" cage wire across the top of my trough that I use to water the chickens. Having this wire over the water prevents the poultry from drowning themselves in the water. What happens is that they hop up and try to perch on the edge of the trough, but teeter and fall in, or get pushed in by another bird. That's an automatic waterer on the left side of the trough, and this setup has been pretty good for me. It's simple, waters multiple animals, and is turkey safe. It also takes a while to ice up. The ice freezes the feed hose first. it takes 2 weeks of below-freezing to freeze the water. Here a daredevil turkey flirts with death by walking along the edge of the trough. Note the brick on the right edge of the photo. That's there to allow smaller birds to drink without having to hop up. I use the cage wire because i had some fatalities with chicken wire, my first choice. They seemed to get their feet stuck in the chicken wire and get hypothermia and die. the cage wire is stiff enough that they can get a good grip on the wire and just walk out. These are my katadin hair sheep. They shed every spring, leaving the coats looking like this, and making them pretty much care-free. I've been experimenting with these sheep to see what the husbandry is like, and honestly, they've been no trouble at all. A mineral lick and good grass and they really do well. Here they're all looking at the dog coming up from the right side of the photo. The brown one on the left is the ram. He thinks about challenging me every now and then. He hasn't yet, but I suspect that I'll get butted at some point. Not sure what I'll do. depends on how bad he gets me. He's a handsome fellow. They're all completely full of delicious grass. I've talked about the pig feeders making life easier for me, and it took me a while to figure out something that I could use to feed 500 chickens. I wish I could say I thought of it, but this idea actually came to be by accident. I get a load of wood chips now and then from tree service companies, and I use those chips in a variety of ways. One day there was a tattered garbage can buried in the chips. I think that what happened was that the garbage can got tossed into the back of the chip truck and got buried. They left it when they dumped the load of chips. So I dug it out and put it where they'd see it, but after 3 weeks noone had picked it up. At the time I had some sacked feed that rats had gotten into and chewed holes in, and I put the feed into the tree service garbage can, and called it a day. The garbage can had some cracks in it, large enough for feed to leak out, and I found chickens eating the feed from the cracks, and the light went on in my head. a 32 gallon garbage can makes a 100lb feeder for about $15 total cost. I put the garbage cans up on blocks so that the feed doesn't get wet when it rains. the lid keeps the chickens from crapping into the feed and keeps the feed dry from the top. At the bottom I cut a small hole. I've put the quarter up there as a size reference. it's a triangle, about 1" tall. Now over time, the chickens pecking and rodents will enlarge this hole. I buy a piece of roof flashing and put it inside to keep the hole size small. This particular feeder is feeding smaller chickens, so the hole is small, and the type of feed is a mash -- basically a powder -- and I kick the feeder every day to make sure that the feed is flowing to the feeding points. Two of these feeders feed my flock of 500 chickens for a week. do you sell small pigs? I get calls every few weeks from people who want to buy a small pigs. they spot the weaner pigs, like the little pink pig here, and think they're super cute. And they are very cute. This little pink pig probably weighs 15lbs. 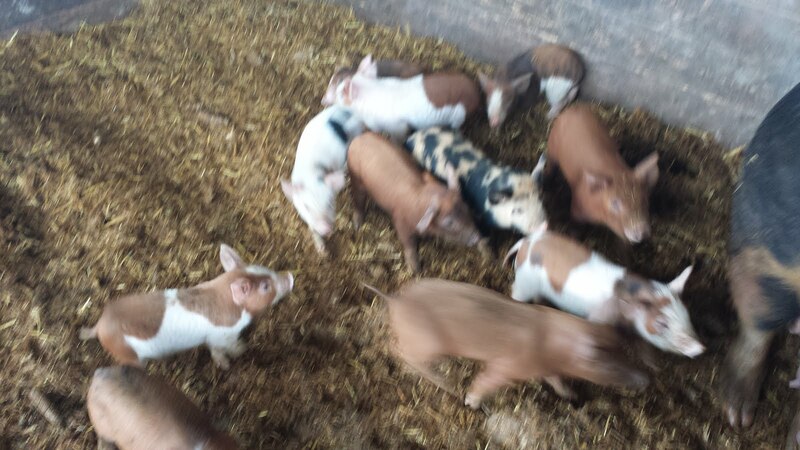 But in 7 to 8 months, that little pig will be the size of the larger pig to the left. That's a big pig; that pigs shoulders are broader than mine. I'm guessing that the bigger pig is somewhere north of 450lbs. The problem is that when they get that big they hog the couch all up. So no, I don't sell small pigs. I've found that a two-strand electric fence is required instead of my one strand, when I've got both pigs and cows in the same pasture. The basic rule is that each strand has got to be nose high for the target animal. So here I've got a high strand that is actually aimed at containing the cattle, and a low strand that is aimed at the sheep or pigs. The sheep will jump over a low strand, or go under a high strand, so two strands are necessary for them. For the cows I can get by with a single high strand, with the pigs, a single low strand. Once a week I feed the pigs. Here I've got a 2,000lb supersack of feed hanging from a chain attached to the chain hook I welded onto my front loader bucket. This is actually pretty hard to do. First you have to get the supersack here -- about 500' from the farm road. When I'm carrying a ton on the front loader I'm actually lifting it as little as I can to keep my center-of-mass low. If I have the sack high, as shown in this photo, and I hit a bump, I could tip the tractor over. After you've carried it low across the field, then you have to make sure that you don't dent or knock the lid off the feeder when you're approaching. You can see by the dents in the feeder that there's been a few mishaps. Next you get to the part that makes me the most nervous. If you look closely at the bottom of the sack you'll see a little bulge. There's actually a string there that you untie to get the bag to dump. I always worry that the chain will give away and snap my arm over the edge of the feeder and I'll have to cut it off to save myself. Or other similar dire thoughts. When I'm feeling particularly paranoid about this I'll take a long knife and cut a hole in the sack so I don't have to get underneath it at all. Yea, it's probably silly, but some days it's just that way. After the sack dumps into the feeder I take it back and go and load up the other feeder. Between these two feeders I have 5,000lbs of feed in the field when I'm done filling. I find that these feeders have made my life much easier -- feeding is a once-a-week chore instead of a daily chore. Well worth the money. The sheep seem to prefer the shorter grass, closer to the ground. They'll avoid the longer grass in preference for this shorter grass. they like shrubs, too. In particular they've been picking on a patch of willow at the edge of the pasture. So much so that they've stripped all the branches they can reach. I didn't know that sheep ate brush, too. In order to get to the shorter grass that they prefer, the sheep will often walk directly behind the cattle and eat the shorter grass that's been exposed by the cattle grazing. The cattle prefer the tops of the grass and the seedheads. I think that the sheep feel safer with the cattle, too. Since I use my equipment pretty much every day, stuff wears out. Today's little maintenance chore is replacing the center tire of my 3 axle trailer. At the top of the photo you can see supersacks of feed; each one of them is a standard ton, or 2,000lbs, of feed. There's a total of 10,000lbs of feed on this trailer at the time that this photo was taken. I have no idea what happened here. maybe I hit something, or somehow cut the tire on a rock or something. I'm happy that I spotted the bad tire before it blew out. Tires are one thing that I don't skimp on, or mess around with. Having a tire blow out when you're carrying a load is a good way to spread your load (and yourself) all over the highway. This may look like an innocent turkey to you, but she's the terror of the pasture. This particular hen turkey has 4 little poults that she's raising, and she's staked out a patch of pasture that's HERS alone! No one is allowed! CHASE THE SHEEP! BEGONE SHEEP! Leave TURKEYLAND NOW, evil sheep! She chases them a good 45 feet, and then, mission accomplished, returns to her little brood. If you click on this picture for a larger version, you'll see the head of this hen turkey peering out of the grass like a periscope. It's like our own little turkey submarine, ready to spring out and defend TURKEYLAND! Pigs are pretty funny creatures. In raising them I've had the opportunity to watch different age pigs, and know some of them for years. This is the story of Oinkalicious (the larger pig to the left in the photo below), and the little pig that doesn't have a name. These two pigs are in a big pasture; 10 acres or so, half grass, half woods. But somehow, like all of the other pigs, they'll find themselves a few feet from a small group of pigs every day of their lives. They prefer to be in close company with their friends. And I really can't call it anything other than friendship. They'll play together, and sleep together, and root in the dirt together and hang out in small groups, usually 4-6 pigs. Here, the little pig would like to make friends with Oinkalicious, and is a little shy about it. Oinky glances at him, and then away. So he continues his little friendship dance. A few steps closer, and then a few more, and then, if oinky tolerates it, he'll lay down next to her and sleep with her. It's a warm day -- it's nothing to do with being chilly. Contact is important to a pig -- they sleep in communal groups, and in this way, the confinement operations mimic part of a pigs social environment. Even with acres of space, these pigs prefer life 6' from each other or less. The difference is that they get to roam around and choose their friends, and I like that idea. Andrea and I went to a local u-pick blueberry farm. Lovely berries. Picked 25lbs for freezing and jams. Have to go back now. They're really good. $1.80/lb. Took a half hour to pick 25lbs. What is a reasonable slaughter experience? I went to see Food, Inc. tonight, a movie that talks about our food system, and there were a couple of things that stood out to me in that movie, but the biggest one was related to animal slaughter. There's a scene in the movie of a chicken processing line. Chickens are already plucked and on a conveyor belt; you can see a thousand or more chickens being conveyed this way as workers cut bits off them and put them onto the line. This scene drew no reaction from the audience at all. Those chickens are mixed with hundreds of other birds in baths of water to chill them and "clean" them, and then the internal organs from some other birds get stuffed into them and the whole thing is really pretty icky. There's a scene where a food producer (Joe Salatin) is talking about chickens and they put a couple of chickens in killing cones. the worker picks up the chicken by its feet, puts it into the cone head down, and then reaches up from the bottom of the cone to pull the head of the chicken out. He then cuts the throat of the chicken, making one cut on each side of the jaw. This got gasps from the audience. Mr. Salatin is talking about his operation, and in the background there were more killing cones in operation. More gasps. In fact, I don't think that the audience heard anything he said. Audible gasps as each chicken was killed. This movie showed beef being herded into a slaughterhouse, but not a kill floor. I think that if they're going to talk about beef, you should see what it looks like to kill it there, too. Show a farm kill and contrast it to a factory kill. Show the public what their money is supporting -- both ways! It drove home to me how far most of the public is from their food, and to some extent how shocking or surprising slaughter is for most people. I think that if you're going to eat meat you should be prepared to pick up the knife yourself. It changes how you view your food, and for me, it makes it harder to waste any of it. As I've mentioned before, I've got a young dog that is too interested in chickens. He killed two of them this morning, and I'm going to try the chicken collar as correction. Both chickens are wired to his collar. The theory is that after a few days of having to carry around the chickens, and smell them, and have them there at all times, that it'll deter his interest in chickens in the future. This is the first time that I've tried this, so I'm curious to see if it'll work. Found this blog today, thought it was interesting. Someone who's actually taking the leap and eating locally and seasonally. We've had the hottest day ever in Western Washington a few days ago, and the pigs are really feeling the heat. They've excavated a wallow for themselves and are using it in groups. If I were a pig, that's where I'd be, too. If you look closely in this picture, the larger pink pig is making good progress. it's actually pretty shallow -- maybe 18" deep -- and the smaller pig is alternatively swimming and riding on her back. there's some squealing and grumbling about that, but there's no risk of the larger pig being pushed under. when the smaller pig is on her, she's firmly on the ground. They've got narrow inlets that they use to enter and leave the wallow. Here big momma is making her slow way up. the piglets were bathing in the exit, and they're not really happy that momma pushed all of the water away and is squeezing them against the sides of the channel. They work it out though -- big momma moves on through, and the piglets go back to floating. floating is a favorite pastime. here's three pigs quietly floating, looking a lot like battleships. The bigger pigs know the water is pretty cool stuff, but the smaller pigs approach it with care. The black and white piglet in the upper left is trying to get out, but the bank there is pretty steep. the pink and black piglets are very interested in the water, and will eventually slide in, but they have to do it very carefully. There's usually an eeek! just as they lose their grip on the bank and plunge into the water headfirst -- and then they're in the water, and that's pretty darned nice.